Q. How many days do I need to be at the resort before we can get married? A. For legal ceremonies, you must be at the hotel three full business days before the wedding to have enough time to have a blood test and ensure that all legal documents are in order. 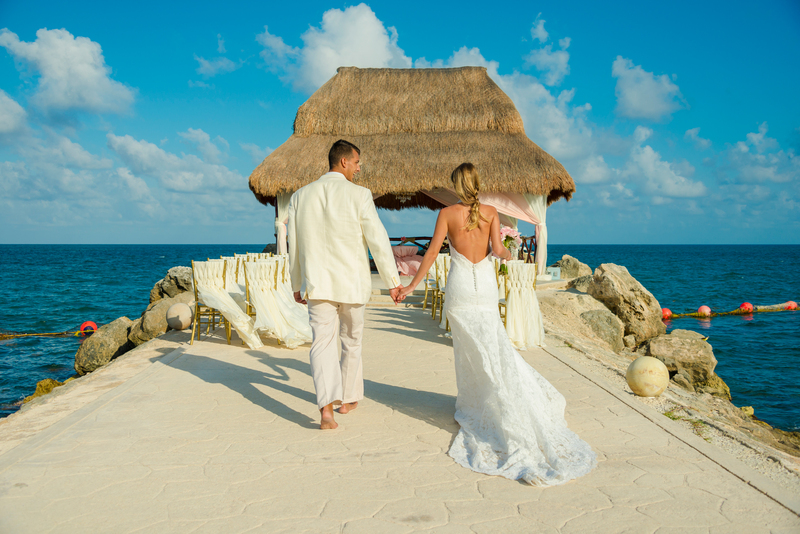 For symbolic ceremonies, you must arrive at the resort two business days before the wedding. Please note that Saturdays, Sundays and Mexican national holidays are not considered business days. Q. Are there any restrictions on dates or times for any type of ceremony? A. As long as there is availability at your chosen venue, you may get married on any day of the week and ceremonies may be conducted at any time day or night. Q. Are weddings performed in México legal in the U.S.? A. Yes, civil ceremonies performed by a judge in México are legal in the U.S when you pay the additional notary fee. The notary validation process takes about 45 days after the paperwork is submitted following the wedding ceremony. Your Wedding Planner will mail your notarized certificate directly to your home. Please note, the certificate will be in Spanish, and it is the couple’s responsibility to translate and register the marriage certificate at their local city hall or courthouse once it’s received to make it binding and official in their home country. Q. What is an Apostille Certificate? A. A designated state authority may provide its citizens with authentication services on documents that will be used for legal and administrative purposes overseas. An Apostille Certificate with a raised or stamped seal is issued to authenticate a public document for official use in a foreign country. To learn if your county requires an Apostille Certificate for marriage licenses, please visit your State Department office or website before departing for your trip. Q. Can children attend the wedding? A. All El Cid Resorts are family-friendly hotels where children of all ages are welcome to be part of your celebration. Q. Can guests who are not staying at the hotel attend the wedding? A. Yes, guests staying at different hotels may join you for your ceremony and reception. However, please be advised that they must purchase a wedding day pass to enter the resort for an additional fee. The pass is good from the time of the ceremony until the end of the reception. Passes should be arranged and purchased in advance of the wedding, and the hotel must be provided with a list of your outside guests. This process should be coordinated with your Wedding Planner in advance. Q. Is the ceremony performed in English or Spanish? A. 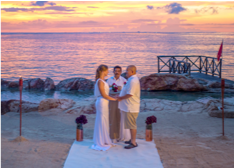 Legal and non-official ceremonies performed by a judge or a minister may be performed in English, Spanish or can be in dual languages when performed in the Riviera Maya or Cozumel. In Mazatlán, due by a new state law, the judge is required to perform the ceremony in Spanish. However, he or she can provide the translation so that it may be read in English by a wedding party member or guest of your choosing. Q. What if we are not traveling with witnesses for the ceremony? A. For legal ceremonies, the Hotel can provide the witnesses required at no additional charge. Please let your Wedding Planner know in advance if you will require this service. Q. Can I have my blood test administered in my home country before the event? A. Unfortunately, Mexican law requires that blood tests for the legal ceremony be performed in México. For your convenience, the resort’s onsite medical doctor can perform the tests when you arrive. The charge is $230 USD per couple. Please note the tests are not included in any of the wedding experience packages. Q. Can I use my own photographer? A. 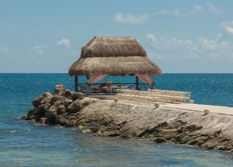 At our Riviera Maya and Cozumel locations, photographers and videographers that are not on the list of the hotel’s approved vendors are not allowed on hotel property unless pre-approved by the hotel. An additional fee for outside photographers and videographers will apply. This fee is waived if the outside photographer or videographer stays in the hotel. In Mazatlán you may bring your own photographer without incurring an additional charge. Note: The same rules apply for all vendors, such as florists, decorators and musicians. Your Wedding Planner can help coordinate all the services you desire through our network of approved suppliers. Q. Can I bring my own music for the ceremony? A. Yes, we encourage all our couples to customize their events with unique playlists to create the perfect ambiance. Be sure to discuss with your Wedding Planner any special needs you may have for audio and sound equipment as rental of equipment may be necessary depending on your event’s needs. Q. What do I need to do to secure the wedding date? A. You will need to sign the hotel’s event contract and submit a deposit for 50% of the toal wedding experience package price. Q. Do you have Catholic chapel in the Hotel? A. Although our hotels do not have Catholic chapels on their grounds, in all locations there are chapels within a short drive to the resorts. Please inquire with your Wedding Planner regarding availability and document requirements for marriage ceremonies. Q. Do you provide a shuttle to and from the airport for El CID guests? A. Airport shuttle transportation can be arranged via the hotel’s onsite ground transportation company for very competitive prices. Q. Do we need to send any documentation prior to our arrival in México? A. Yes, documentation will be requested two weeks in advance. To avoid any possible complications or delays, please ensure that all legal documents contain the same names and spellings as noted on your passports. Q. In the event of rain, will a back-up location be provided for weddings held outdoors? A. Our Wedding Planners always book an emergency indoor space as a back-up in the event that inclement weather prohibits an outdoor event from taking place. 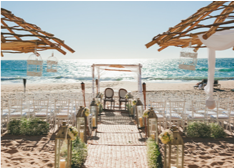 For the safety and enjoyment of all our guests, your Wedding Planner will make the final call on whether an outdoor event can be safely held in the originally booked location due to weather complications.